Four-speed automatic gearbox which offers a choice between the comfort of fully automatic operation, enhanced by sport and snow programmes, or manual gear changing. 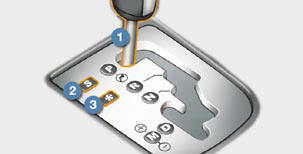 - manual operation for sequential changing of the gears by the driver. 3. Button " " (snow). - Immobilisation of the vehicle, parking brake on or off. - Reversing manoeuvres, vehicle stationary, engine at idle. - Immobilisation of the vehicle, parking brake on. M. +/- Manual operation with sequential changing of the four gears. Push forwards to change up through the gears. Pull backwards to change down through the gears. When you move the lever in the gate to select a position, the corresponding indicator is displayed on the instrument panel. -. Invalid value during manual operation. 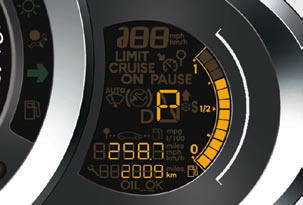 Press the brake pedal when this indicator lamp is displayed on the instrument panel (e.g. : starting the engine). Select position P or N .
If this procedure is not followed, an audible signal is heard, accompanied by a message on the multifunction screen. With the engine running, press the brake pedal. Select position R , D or M .
Gradually release the brake pedal. The vehicle moves off immediately. If position N is engaged inadvertently while driving, allow the engine to return to idle then engage position D to accelerate. When the engine is running at idle, with the brakes released, if position R , D or M is selected, the vehicle moves even without the accelerator being pressed. When the engine is running, never leave children in the vehicle without supervision. When carrying out maintenance with the engine running, apply the parking brake and select position P .
Select position D for automatic changing of the four gears. The gearbox then operates in autoadaptive mode, without any intervention on the part of the driver. It continuously selects the most suitable gear according to the style of driving, the profi le of the road and the load in the vehicle. For maximum acceleration without touching the lever, press the accelerator pedal down fully (kick down). The gearbox changes down automatically or maintains the gear selected until the maximum engine speed is reached. On braking, the gearbox changes down automatically to provide effi cient engine braking. If you release the accelerator sharply, the gearbox will not change to a higher gear for safety reasons. Never select position N while the vehicle is moving. Never select positions P or R unless the vehicle is completely stationary. These two special programmes supplement the automatic operation in very specifi c conditions of use. Press button "S" , after starting the engine. The gearbox automatically favours a dynamic style of driving. S appears on the instrument panel. Press button " ", after starting the engine. The gearbox adapts to driving on slippery roads. This programme improves starting and drive when traction is poor. appears on the instrument panel. At any time, press the button selected again to quit the programme engaged and return to auto-adaptive mode. D disappears and the gears engaged appear in succession on the instrument panel. In the event of the engine labouring or over-revving, the gear selected fl ashes for a few seconds, then the actual gear engaged is displayed. It is possible to change from position D (automatic) to position M (manual) at any time. When the vehicle is stationary or moving very slowly, the gearbox selects gear M1 automatically. 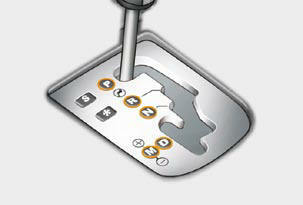 Before switching off the engine, you can engage position P or N to place the gearbox in neutral. In both cases, apply the parking brake to immobilise the vehicle. If the lever is not in position P , when the driver's door is opened or approximately 45 seconds after the ignition is switched off, a message appears in the multifunction screen. Return the lever to position P ; the message disappears. When the ignition is on, the lighting of this warning lamp, accompanied by an audible signal and a message on the multifunction screen, indicates a gearbox malfunction. In this case, the gearbox switches to emergency mode and is locked in 3rd gear. You may feel a substantial knock when changing from P to R and from N to R . This will not cause any damage to the gearbox. Do not exceed 60 mph (100 km/h), local speed restrictions permitting. Contact a CITROËN dealer as soon as possible. - if you force the movement of the gear lever from the P position to another position when the battery is fl at.